Japan’s All Nippon Airways (ANA) plans to expand its Southeast Asian network in 2015 by launching new destinations and expanding partnerships. Services to Cambodia and Malaysia are under consideration, which would give ANA an online presence in Southeast Asia’s eight largest countries. ANA has been looking over the last two years to supplement its position in Southeast Asia, which it sees as a key growth market, through strategic acquisitions. But after not completing a tentative deal to acquire a 49% stake in a small Myanmar-based carrier and passing up on potential stakes in larger flag carriers, the focus is now primarily on organic growth. This will also help ANA's growing North America-Asia transfer traffic. ANA is also planning to improve its business class product in Southeast Asia by introducing a lie-flat seat on longer regional routes. ANA has been serving Southeast Asia with 767s and 787s configured with recliner style business class seats although rival Japan Airlines (JAL) has introduced a lie-flat business class product on some of its Japan-Southeast Asia routes. ANA currently serves seven Southeast Asian destinations – Bangkok, Hanoi, Ho Chi Minh, Jakarta, Manila, Singapore and Yangon. Southeast Asia has been a major growth region for ANA in recent years and has been identified as a focus area in its long-term strategy. Over the last two years ANA has increased seat capacity to Southeast Asia by approximately 44% from about 15,800 one-way weekly seats in Dec-2012 to about 22,700 one-way weekly seats in Dec-2014. The increase over the last 12 months has been about 29%, according to CAPA and OAG data. ANA currently accounts for about a 14% share of seat capacity in the Japan-Southeast Asia market while JAL has about a 16% share. Foreign carriers account for about 70% of capacity, led by a 16% share from Thai Airways. ANA currently operates 13 daily passenger flights to Southeast Asia. This includes six flights from Tokyo Narita (one each to Bangkok, Ho Chi Minh, Jakarta, Manila Singapore and Yangon) and seven from Tokyo Haneda (two to Singapore and Bangkok plus one to Hanoi, Jakarta and Manila). The recent increase in capacity to Southeast Asia has been driven primarily by the launch of new routes from Haneda using newly awarded international slots at Tokyo’s close-in airport. Services from Haneda to Hanoi, Jakarta and Manila were launched on 30-Mar-2014. These all represented new flights for ANA as the carrier has maintained its daily services from Narita to Jakarta and Manila. Hanoi is an entirely new destination and is not served from Narita. Ho Chi Minh, which ANA has served for several years, is still only served from Narita. Also on 30-Mar-2014 ANA increased Haneda-Bangkok and Haneda-Singapore from one to two daily flights. But in these cases the capacity was shifted from Narita as ANA reduced Narita-Bangkok and Narita-Singapore from two to one daily flight. ANA is planning to restore the second daily flight on Narita-Singapore from 11-Jun-2015 and on Narita-Bangkok from 1-Aug-2015, resulting in an approximately 30% increase in capacity in the Singapore and Thailand markets. Bangkok and Singapore are already ANA's fifth and sixth largest international markets (and the two largest outside North Asia). Just four years ago ANA’s presence in Southeast Asia was limited to only three markets – Bangkok, Ho Chi Minh and Singapore. Jakarta and Manila were initially launched in early 2011 from Narita. Both are now served from Narita and Haneda – resulting in a relatively rapid spool up of capacity given that ANA did not have any online presence in Indonesia or Philippines before 2011. ANA also launched services in Oct-2012 to Yangon, which continues to be only served from Narita. 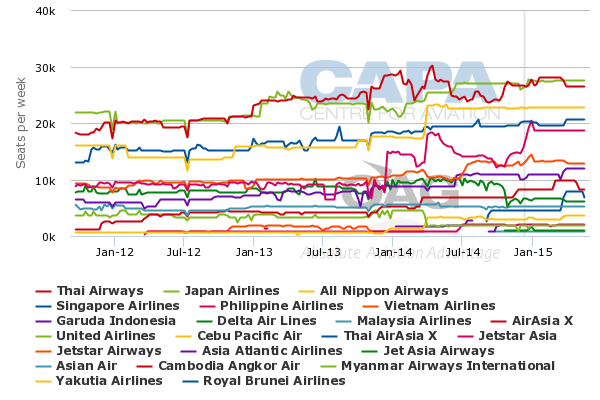 Southeast Asia now accounts for about 20% of ANA’s international seats and 19% of ASKs, according to CAPA and OAG data. ANA has exactly the same number of flights to North America – 13 per day – as to Southeast Asia and a nearly identical number of seats. This balance is no coincidence. Southeast Asia-North America has emerged as an important sixth freedom market for ANA and has helped enable rapid capacity growth to both regions. But this is not to say all of the passengers transfer from North America to Southeast Asia. Over the last two years ANA has increased seat capacity to North America by approximately 22% from about 18,800 weekly one-way seats in Dec-2012 to about 22,800 seats in Dec-2014, according to CAPA and OAG data. ANA currently accounts for about a 20% share of seats between Japan and North America, making it the third largest carrier in the market behind JAL and Delta (each of which have about a 22% share). ANA currently serves nine destinations in North America. Los Angeles and Honolulu are served from both Haneda and Narita; Vancouver is only served from Haneda; and Chicago, New York, San Francisco, San Jose, Seattle and Washington Dulles are only served from Narita. Chicago, Honolulu, Los Angeles and New York are served with two daily flights while the other four destinations are each served with one daily flight. Narita remains ANA’s main international hub, including for connections between North America and Southeast Asia. Haneda primarily caters to the local market and domestic connections. But there are also some connections at Haneda between North America and Southeast Asia, including to Vancouver as Vancouver is only served from Haneda. Haneda-Vancouver is operated using peak hour slots at Haneda. ANA is now only able to serve the US from Haneda with late night or very early morning slots although daytime flights could become a possibility in future if the US and Japan are able to forge a new agreement. The share of sixth freedom traffic also grew significantly in 1HFY2014. As CAPA previously analysed, sixth freedom traffic was up 33% year over year. North America-Asia is ANA’s main sixth freedom market. While ANA has expanded rapidly in Europe over the last year the opportunities to offer international connections beyond Tokyo from Europe is relatively limited. In addition to Southeast Asia, ANA offers connections from North America to India and carries a large volume of passengers from North America to North Asian countries other than Japan. ANA particularly has targeted Southeast Asia and Greater China in building up its sixth freedom traffic base. 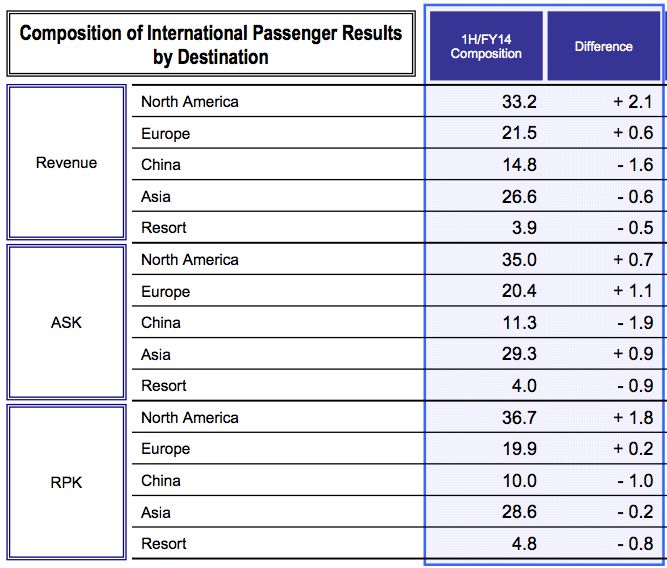 Narita-Bangkok and Narita-Taipei see the highest volumes of non-Japanese passengers. About 80% of ANA passengers between Narita and Taipei are not Japanese. This is an extremely high figure for an airline that has traditionally relied on its Japanese clientele, which are generally loyal to Japanese carriers. As ANA continues to expand its international network – in both Asia and North America – more routes will see a higher portion of international passengers. Further growth in sixth freedom traffic is not the only driver of this trend. ANA is also seeing growing inbound demand as Japan emerges as a popular tourist destination. Japan has been actively promoting its tourism sector as part of an initiative to double visitor numbers from 2013 to 2020 while the recent depreciation of the yen has made Japan significantly more affordable. ANA is planning to further expand its Southeast Asian and North American networks in FY2015 (fiscal year commencing 1-Apr-2015). The expansion will again be made possible by increases in sixth freedom traffic. ANA is not planning to pursue further expansion in Europe in FY2015 as it prefers to focus on giving the capacity recently added to Europe time to be absorbed. ANA has grown seat capacity to Europe by more than 40% over the last year. 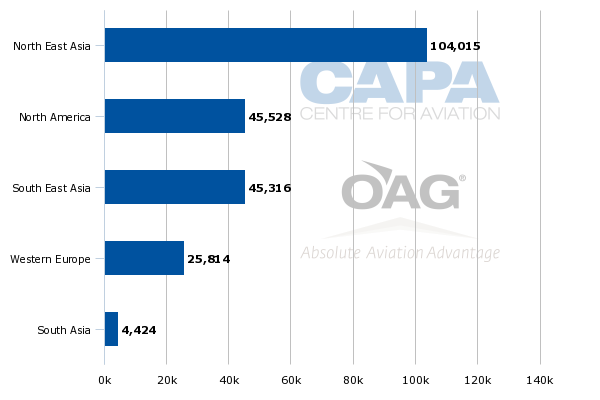 It is currently the market leader between Japan and Europe with almost 13,000 weekly one-way seats and about a 22% share of total seat capacity, according to CAPA and OAG data. ANA now operates seven daily flights to five European destinations, including four from Haneda (Frankfurt, London, Munich and Paris) and two from Narita (Dusseldorf and Paris). ANA has secured over the last year new daytime slots at Haneda for Europe, enabling it to launch new services and move some Narita flights to Haneda. ANA is also looking at potential new destinations in Asia-Pacific other than Southeast Asia for FY2015, including Australia and India. ANA currently serves two destinations in India, Delhi and Mumbai, but does not serve Australia. Japan Airlines, Qantas and Jetstar are the only carriers currently operating non-stop services between Australia and Japan. JAL and Qantas serve Sydney-Tokyo while Jetstar operates from Cairns, Gold Coast and Melbourne to Tokyo and from Cairns to Osaka. But the launch of services to Australia and additional destinations in India are long shots for FY2015. Australia is unlikely in the medium-term and possibly long-term. Southeast Asia remains a strategic focus for ANA and will almost certainly see further capacity growth in FY2015 (in addition to the increases already announced for the Bangkok and Singapore markets). ANA CEO Osamu Shinobe told CAPA at last month’s Association of Asia Pacific Airlines (AAPA) Assembly of Presidents in Tokyo that Cambodia and Malaysia are under consideration. Kuala Lumpur and Siem Reap would be logical new destinations for ANA as they are popular spots for Japanese tourists and also have potential sixth freedom traffic to North America. The Cambodian capital Phnom Penh, which has more business traffic than Siem Reap, could also be a possibility. Neither Phnom Penh nor Siem Reap are currently served non-stop by any carrier from Tokyo. Kuala Lumpur-Tokyo is a much larger market and is currently served by AirAsia X, JAL and MAS. AirAsia X has expanded its presence in Japan over the last year and now has a 54% share of seat capacity between Malaysia and Japan compared to 11% for JAL and 35% for MAS, according to CAPA and OAG data. A Haneda-Kuala Lumpur service would be an option for ANA as no Japanese carrier currently serves Kuala Lumpur from Haneda. However, as Japan has not made Malaysia available to daytime Haneda slots, ANA would have to use midnight hour slots unless there was a regulatory change. AirAsia X currently operates daily services to Haneda, Narita and Osaka as well as four weekly flights to Nagoya. JAL and MAS serve Narita-Kuala Lumpur with seven and 10 weekly flights respectively. MAS also serves Kota Kinabalu-Narita with three weekly narrowbody frequencies. Tokyo has remained a strong market for MAS and could see additional capacity even as the flag carrier restructures. MAS is keen to launch a daily service to Haneda while keeping seven weekly frequencies at Narita. The addition of Malaysia and Cambodia would give ANA service to eight of the 10 countries in Southeast Asia/ASEAN. The remaining markets would be Brunei and Laos, which are not likely to support services from a Japanese carrier given their very small size. ANA is able to serve Brunei and Laos through codeshare and interline agreements with other Southeast Asian airlines. ANA also currently serves Malaysia and Cambodia as offline destinations. But its strategy has been to cover main cities and rely on partnerships for secondary cities. For example ANA recently began codesharing with Garuda and Philippine Airlines, giving ANA access to domestic destinations throughout Indonesia and the Philippines. ANA also has longstanding codeshare partnerships with the Star Alliance’s two Southeast Asian members, Singapore Airlines and Thai Airways. ANA is keen to continue expanding its codeshare relationships with its existing Southeast Asian partners as well as add new partners from the region. It wisely recognises it cannot cover the entire region with its own metal. ANA also has been looking over the last two years to expand its presence in Southeast Asia through acquisitions. In Aug-2013 ANA forged an agreement to acquire a 49% stake in Myanmar’s Asian Wings but subsequently decided against completing the deal. Over the past year several much larger Southeast Asian flag carriers have also been looking at selling strategic stakes to foreign carriers including Garuda Indonesia, Philippine Airlines and Vietnam Airlines. But no deals have materialised. ANA would have looked at some or all of these carriers as part of its evaluation of potential opportunities in the Southeast Asian airline sector. The fact it did not make any moves signals ANA has perhaps stepped back from its strategy of pursuing airline investments in Southeast Asia, which was a surprise announcement with many questions and doubts. A forgotten but still important component of ANA's investment strategy has been in non-flying businesses like pilot training, and moves into MRO are also expected. Mr Shinobe told CAPA that his focus in Southeast Asia is on airline partnerships and growing the network. The parent company ANA Holdings has been leading the search for investment opportunities. ANA will continue to be on the lookout for potential opportunities – as is the case with other Asian airline groups such as Singapore Airlines. But it seems unlikely ANA will make a move in the short to medium term. ANA also sees an opportunity to improve its position in the Southeast Asian market through product enhancements. The carrier particularly sees room to grow its share of the corporate and business sectors of the Southeast Asia-Japan market (and the Southeast Asia-North America market) by upgrading its business class product on longer medium-haul routes. The 767s and 787s that ANA now uses for Southeast Asian routes are configured with its Cradle recliner seat in business class. This is a weakness as other carriers in the Japan-Southeast Asia market now offer lie-flat seats in the business cabin. A lie-flat product is an attraction given the relatively long duration of flights in this market and the fact a large portion operate during overnight hours. ANA also does not currently offer a premium economy option on its flights to Southeast Asia. Mr Shinobe said some Japanese corporations now have policies that no longer authorise business class for flights to Southeast Asia but will allow premium economy. ANA sees an opportunity to introduce premium economy as well as a lie-flat business class product to Southeast Asia as it takes delivery of more 787s. ANA currently operates 33 787s with 47 additional aircraft on order, according to the CAPA Fleet Database. Some of ANA’s existing 787s have lie-fat business class seats and premium economy cabin. But these are only used on long-haul routes including to Dusseldorf, Munich, San Jose and Seattle. Mr Shinobe told CAPA that all of the additional 787s that have not yet been delivered will be configured with lie-flat business class seats and a premium economy cabin. These aircraft will be in two different configurations but with identical products (one of the configurations will have a larger business cabin). ANA plans to move the existing 787s that are now used on Southeast Asian routes (with the Cradle seat) to short intra North Asia routes such as Hong Kong. Over time most Southeast Asia flight will see the improved premium product. Some shorter Southeast Asia routes could continue to see the current regional product. One such destination is Manila, which is only a four hour flight with all sectors operating during the day. Offering a lie-flat business class and introducing premium economy on Southeast Asia routes will improve ANA’s position significantly in the Southeast Asia-Japan and Southeast Asia-North America markets. Unlike several of its competitors, ANA currently is unable to offer a lie-flat or premium economy product on both sectors between Southeast Asia and North America. JAL has already improved its position in the Southeast Asia market by offering lie-flat business class seats on some routes. For example JAL has transitioned the Haneda-Singapore route from regional 787s, which are also not configured with a lie-flat product, to 767s that were recently retrofitted to include lie-flat seats in the business cabin. It is a sensible move by ANA to offer a similar product, particularly in important and highly competitive business markets such as Jakarta and Singapore. ANA’s strategy for Southeast Asia in some respects is still evolving. 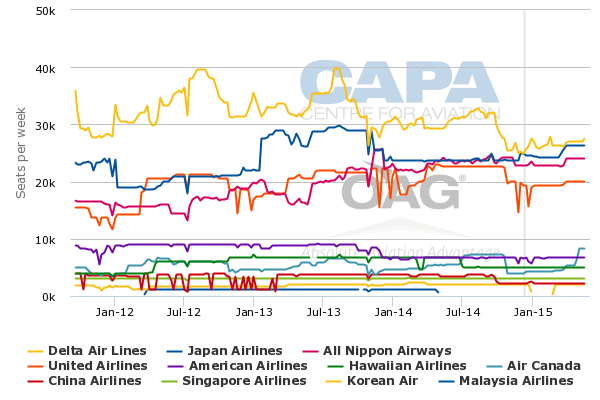 But Southeast Asia clearly has become a strategically important region for Japan’s largest carrier. Further expansion in Southeast Asia – through new destinations and partnerships – is an important component of ANA’s overall strategy. But the forthcoming expansion will also come with its share of challenges as Southeast Asia is a highly competitive market. Yields will inevitably come under pressure as Southeast Asian long-haul LCCs expand in Japan and as ANA increases its reliance on sixth freedom traffic.